The great American Indian Chief Sitting Bull, called her Little Sure Shot. 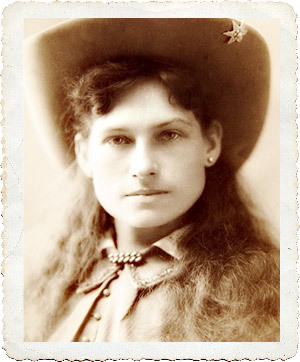 We have know her as Annie Oakley, but to her parents she was Phoebe. Born in Darke County Ohio on August 13,1860 to Quakers Jacob and Susan Mozee, her given name was Phoebe Ann Mozee. To her Mother she was always Phoebe, but to her sisters she was affectionately known as Annie. Her father died in 1866 and the family fell on hard times. Early in Annie’s life she was able to use her father's rifle to always bring food home for the family. She became so well know for her ability to kill game without leaving shot inside the animal, a local restaurant began asking her to supply their wild game. By age 15 she had made enough money to pay off her mother's home mortgage. One of Annie’s customers lived in Cincinnati and he persuaded her to enter into a shooting contest against well-known sharpshooter Frank E. Butler. This was unheard of in that day— a woman competing against a man. Annie not only won the $50 prize money, but she also won the heart of Mr. Butler. They were married the next year and began touring as the vaudeville act Butler and Oakley. 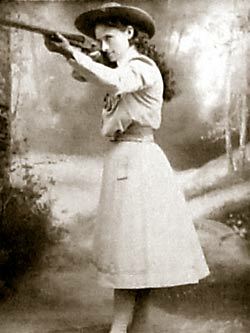 One of the first places that Annie Oakley performed on stage was in Springfield at the Crystal Palace. In 1885 they joined Buffalo Bill's Wild West Show with Oakley receiving top billing. 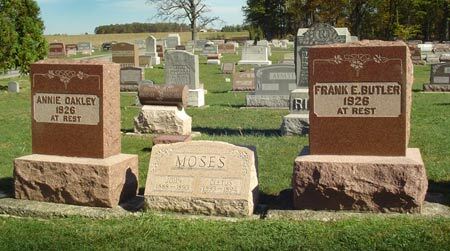 Seeing the great attraction Annie was receiving, Frank decided to serve as her manager and assistant. She was a hit across the country. Her performances were always honest and straight forward. One of her shows had her stand 90 feet away from an assistant as he tossed a dime into the air, she hit it with a single shot. At the same distance a playing card was mounted thin side facing Annie, she raised her rifle, took aim and not only hit the side of the card but was able to place another 5 holes in the card before it hit the ground. The Butlers were with Buffalo Bill for 17 years. During that time she toured not only the United States, but in Europe as well. On these European tours, she was always introduced as a lady of the Wild Wild West, even though she was just a country girl from western Ohio. In 1901 Annie was injured in a train wreck and suffered spinal damage. It would take five surgeries to ease the pain. It did not however, effect her shooting abilities and she continued displaying her shooting abilities. The Butlers even included their dog Dave into the act. Dave the dog, would parade around Annie then jump up on a stool and sit patiently. An apple was placed on his head and Little Sure Shot would carefully take aim and blow the fruit apart. Dave became a constant companion to both Frank and Annie. With the start of World War One Annie volunteered to raise a regiment of women to fight in the war. The government turned her down but she was able to provide a service in the Young Men’s Christian Association (YMCA) and War Camp Community Service. Dave would become the well loved Red Cross Dog. In 1922 Annie and Frank were in an auto accident. Both were seriously injured and slow to recover. Dave was killed by a automobile the next year. In frail health the couple returned to Annie’s hometown of Greenville where the American legend passed away November 3, 1926 with Frank joining her November 21. Both are buried in the Brock Cemetery just north of Greenville. 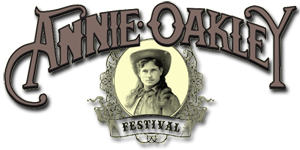 The community still celebrates their hero with the annual Annie Oakley Days Festival every July. Artifacts from Annie and her life can be found in the Garst Museum, 205 North Broadway Street, Greenville Ohio 45331. 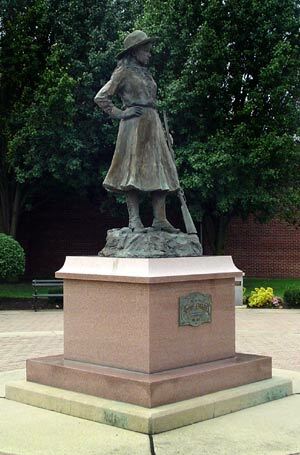 In 2000, a stretch of SR 127 in Darke County was renamed "Annie Oakley Memorial Pike" in her honor.